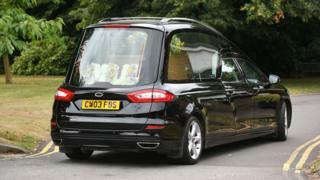 Image caption Dawn Sturgess' coffin was brought to the crematorium with a flower arrangement saying, "Mum". A "very emotional service" has taken place in Salisbury as family said goodbye to Dawn Sturgess, who died from exposure to the nerve agent Novichok. Over 100 people attended the ceremony, including her partner Charlie Rowley, who was also exposed to the agent. The Rev Philip Bromiley, who led the service, said Ms Sturgess "won't be defined" as a person by the tragic circumstances of her death. Her 11-year-old daughter told mourners how much she loved her mother. Public Health England had advised the funeral directors ahead of the ceremony, but reiterated its advice that risk to the public was low. Earlier reports that there would be no pallbearers were incorrect, and Ms Sturgess' coffin was carried into the crematorium. Ms Sturgess, 44, died on 8 July after she and Mr Rowley, 45, were exposed to Novichok the week before in Amesbury, Wiltshire. Mr Bromiley told the BBC that Mr Rowley was sitting on the front row throughout and Ms Sturgess' sister, Claire, delivered her eulogy. After Ms Sturgess' 11-year-old daughter read to the mourners, she received a round of applause. Speaking after the funeral, Mr Bromiley said: "I think there was a lot of shock, but there were moments of laughter and moments of being able to remember who Dawn really was. "Dawn won't be defined by being a story in a tragic set of circumstances. "She was a mum and she was a person, and it was that person we commended to God today." High by James Blunt was played at the start of the service, and it ended with the title song from the musical Fame. Mr Bromiley said the theme of the funeral was peace. He added: "Peace for her family, for her friends and the city of Salisbury and the surrounding towns and villages affected by the chaotic last few months." The chief constable of Wiltshire Police, Kier Pritchard, also said he would be attending, along with deputy chief constable Paul Mills and the police and crime commissioner for Wiltshire, Angus Macpherson. The poisoning of Mr Rowley and Ms Sturgess came four months after the case of the former Russian spy Sergei Skripal and his daughter, Yulia. The Skripals were found unconscious on a park bench in Salisbury in March after coming into contact with Novichok. They have since been discharged from hospital. Ms Sturgess lived in Salisbury, and the couple had been in the city before going to Mr Rowley's flat in nearby Amesbury on 29 June. They collapsed after exposure to the nerve agent at his house on 30 June. A murder inquiry was launched after Ms Sturgess' death. Mr Rowley told ITV News he had earlier found a sealed bottle of perfume and gave it to his partner, who sprayed the substance on her wrists. Police refused to confirm Mr Rowley's claim but had previously said the substance was found in a "small bottle". The UK government has blamed Russia for the attack on the pair in March, but the country's authorities deny any involvement.